My newest course with LinkedIn Learning and Lynda went live a few weeks ago, it covers the upgrade path to Laravel 5.6 and some of the best of the new and improved features, take a look and I hope you learn something new from it. LinkedIn Learning provides online training courses in a variety of subject matters. I’ve been honored to work with them on a few different courses at this point covering primarily PHP and related topics. The latest one went up earlier this week, it covers using Guzzle to communicate with RESTful APIs. APIs are a super popular tool in web development at practically all skill levels. You might start off just using something simple like the Google Maps API to put up a map on some sites and before you know it, you are building an API to be consumed by other software developers (or at least that was my path). If you aren’t interested in working with Guzzle or RESTful APIs, take a look at the LinkedIn Learning site in general there are tons of courses on a wide variety of subjects. You’ll be able to see any new courses I author at https://www.linkedin.com/learning/instructors/justin-yost. Lynda.com is a website that provides online training courses in a variety of subject materials. I’ve been honored to work with them on a few different courses at this point covering both PHP and Ember.js. The latest one went up earlier this month, it covers some of the basics in working with PHPUnit, a unit testing framework and perhaps more importantly learning the Test-Driven Design pattern. TDD is one the biggest things you as a developer and software engineer can do to level up yourself as a developer. It takes you from a style of manual refreshing, testing and looking at things to figure out if something worked to instead validating your software and proving it works the way it’s intended. I’ve embedded below a video covering some of the reasons you should use and do unit testing. If you aren’t interested in TDD or PHPUnit, take a look at Lynda just in general there is probably something of interest for you learn from. Lynda prides itself on producing quality content and it shows both in the courses and in working with them. You’ll be able to see any new courses I author at lynda.com/justinyost. This was a really interesting talk, especially as beforehand, I didn’t have a ton of knowledge of generators. I knew what a generator was and some of the basics, but that was about it. So I learned both about generators specifically, and some more specifically about building coroutines using a generator. Another talk at PHP Vegas Meetup., this one covering some of the more interesting aspects of the CakePHP 3 ORM. This was mostly a last-minute modification of what I will present at CakeFest in Amsterdam, in a few weeks, owing to a drop-out of one of our speakers. I think, this talk was a weaker one for a few reasons. I didn’t have enough time to greatly change the content to better fit with a more general audience that was as highly exposed to CakePHP in general. I also didn’t have enough time or information into why the Cake 3 ORM is better or some of the big differences between it and other ORMs in the PHP world, like Doctrine and Eloquent. All that being said it is highly valuable for me to present this talk in a more comfortable environment at least once before CakeFest. I wrote a post for the Loadsys blog on writing unit tests that are more valuable. This is a problem I greatly struggled with when I first started writing tests and I hope it helps you out. Lynda.com is a website that provides online training courses in a variety of subject materials. I’ve been honored to work with them on now three separate courses. The latest one went up earlier this month, it covers some of the basics of working with CakePHP 3. Interested in working with CakePHP? You should watch the course, learn how easy it is to get started with CakePHP and all that ways that CakePHP is a great web development framework. 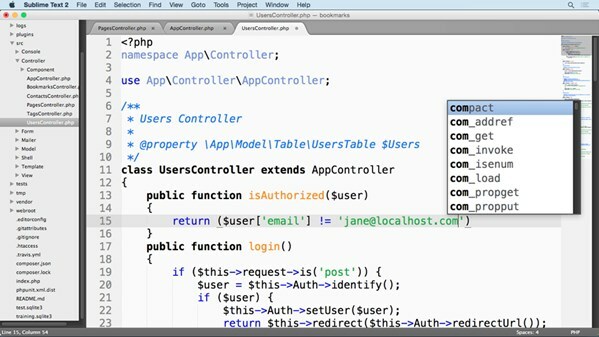 If you aren’t interested in CakePHP, take a look at Lynda just in general there is probably something of interest for you learn from. Lynda prides itself on producing quality content and it shows both in the courses and in working with them. Another talk at PHP Vegas Meetup, this one covered unit testing. I tried to split about 50% on why to do unit testing and the other 50% on some pretty basic unit tests. This was a tough talk to try hitting an hour on. I know it’s a good topic for me to talk on because I have a lot I feel like I could talk about it. At the same time that also means it’s hard trying to say just the right things. Overall I thought this talk was very well received with a few people specifically saying that they thought I did a good job and they got valuable information out of it. The worst part was I had made some minor changes from the version I had uploaded to Speakerdeck, but accidentally deleted the file. So I had to use the older version and it threw me off in a few places. However, it’s a useful reminder to have multiple copies of a presentation for when one needs it. For December’s PHP Las Vegas Meetup, I gave a talk on Dependency Injection, mostly focused on using it focus on better testing. Few things that I should work on in the future. I dropped in the idea of both coupling and DI containers without a ton of explanation thought out before hand of how exactly to present each of those concepts. The talks suffered from trying to figure out how best to explain those mostly on the fly. Otherwise, I think this talk went over very well. For this month’s Las Vegas PHP Meetup, I spoke on PHP Namespaces and PSR-0/4. This was a great beginner talk to give, lots of little things to work the way through and explore and explain. I actually learned a few things in writing this presentation, mostly around autoloaders and how they work.